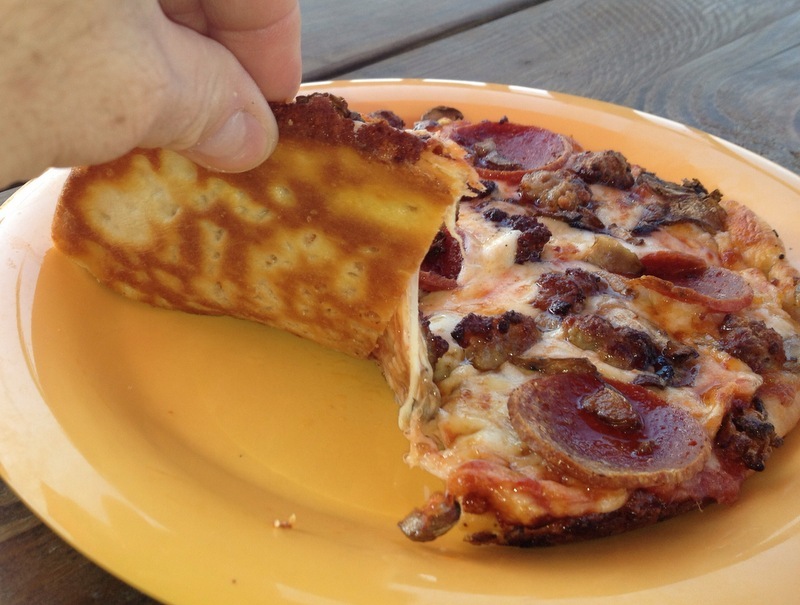 A few months ago we were pleased to be informed of a brand new name to the Omaha pizza scene: Ragazzi’s Pizza located in Ralston. We recently had the pleasure of visiting their establishment and are very happy to have found yet another quality slice in the Omaha area. Ragazzi’s is located just north of Q street on 72nd in the fair city of Ralston, Nebraska, just a cigarette butts toss across the parking lot south of Ralston Keno. Entering their clean and bright restaurant you’ll be greeted with a huge chalkboard on the wall to your right outlining their impressive menu in just about every color of chalk imaginable. Pretty unique and impressive if you ask us. The staff behind the counter was extremely friendly and eager to take our order. If you’re a regular reader of our blog you’d know that I am a devout carnivore. And if I told you Ragazzi’s has a pie on the menu called the Meat Locker featuring pepperoni, Italian sausage, Canadian bacon and seasoned beef, you’d think that there was no way in hell I’d pick a different pizza for dinner, you’d be right 99% of the time. Not tonight. Tonight I’m the one percenter. Tonight we decided on Pepperoni Knots for our app, an Amo Pepperoni pizza for me and a Ragazzi’s traditional for The Pizza Wife. We also selected a few cold beers and found a seat on the patio to enjoy and nice summer evening. Oh and one very important note that brought a smile to The Pizza Wife’s face: they have a pretty decent selection of cupcakes in the case near the register. Nice! At Ragazzi’s you are given a number for your order and when ready, they’ll do the heavy lifting and bring everything out to you with a smile. First out the door tonight were our Pepperoni Knots. 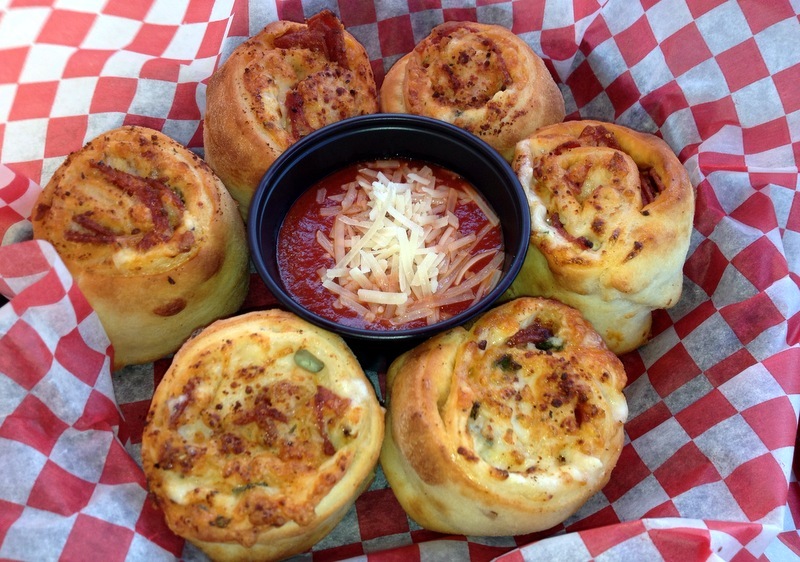 Rolled up like cinnamon rolls, these six beauties are served in a basket with a cup of marinara for dipping and were love at first sight. The first words out of our mouths after our first bite was “Damn. Those. Are. Gooood.” Absolutely amazing. Flaky and flavorful. Inside the flaky dough we found the spicy pepperoni, cheese, and green onions. And an added kicker – ranch*. Yeah, ranch. Inside! I wouldn’t have thought of that combination, but there it was. Needless to say our expectations were running pretty high after the appetizer and our pizzas didn’t disappoint either. The crusts at Ragazzi’s are of the thinner variety. Flaky and buttery. Although I never saw the pizza ovens, I do believe they are baked in a conveyor type oven and they use a dough docker to keep the bubbles under control. 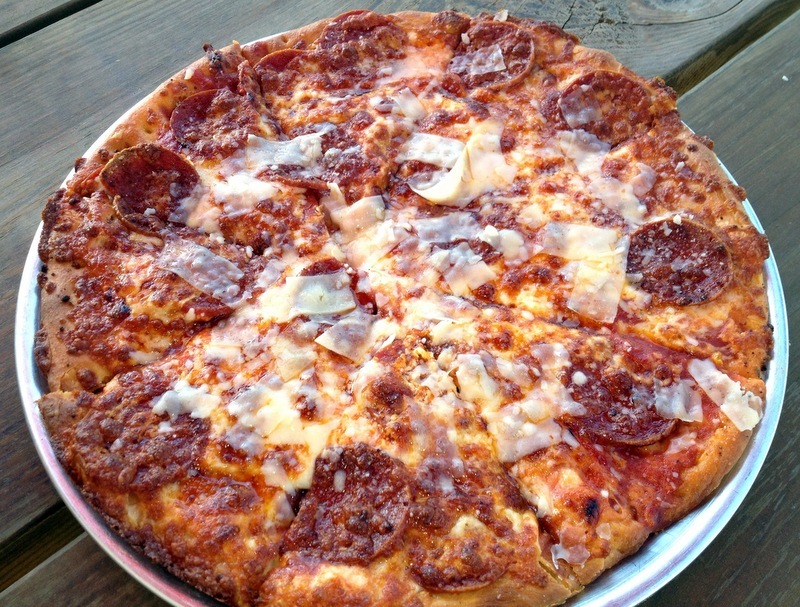 The Amo pizza features pepperoni, Frank’s hot sauce, even more pepperoni mozzarella and shaved parmesan cheese on top. The pepperoni they used was of a thicker cut that I really enjoyed and the Frank’s Red Hot added a sinus-clearing punch to the pie. The shaved parm on top not only looked good, but added a nice touch to the Amo. Something else that was a bit different here was the crispy toppings on this pizza. It’s almost like they flamed the top of the pizza before serving as all of the toppings including the outer crust had a nice crisp to it. Overall I was a big fan of this one and would recommend it to anyone who enjoys a little extra spicy zip. 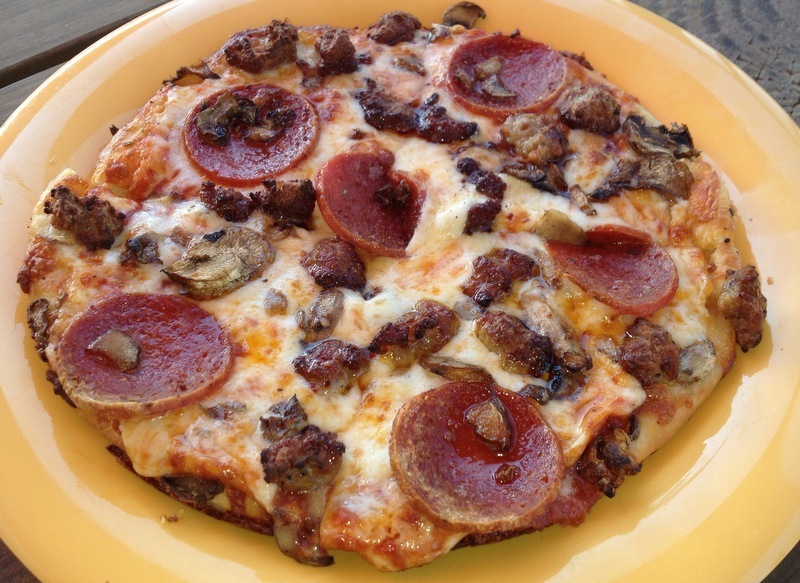 The Ragazzi’s Traditional pizza features roasted garlic, thick-cut pepperoni, mushrooms and Italian sausage and was also quite good. While all of the toppings were fresh and tasty, it was too garlicky for me. The Pizza Wife however just loved it! The mushrooms were very fresh, but sparse and the chunks of sausage were flavorful and sufficiently spicy. Overall we were very happy with our new found pizza place. With friendly, quality service, a good menu and fair prices, we foresee this becoming a favorite spot for many in Ralston and a great addition to the Omaha pizza scene. We enjoyed just about everything on our visit and we certainly recommend you taking time to try them out. The bad: We can’t think of anything. Sauce: Fairly standard. Didn’t stand out much. Cheese: On top of some toppings, below some others. How would you rate Ragazzi’s Pizza? Click on the stars below! Be sure to check out the review done by the Omaha World Herald at Omaha.com as well. This entry was posted in Pizza and tagged Ragazzi's Pizza. Bookmark the permalink. Not even a close 10th to Sortinos or even Totinos. Very disappointed. Thanks to groupon for not a total loss of money!